This self-contained Dust Collection Kit collects dust and debris when using Milwaukee's 6480-20 (H7000) Panel Saw. 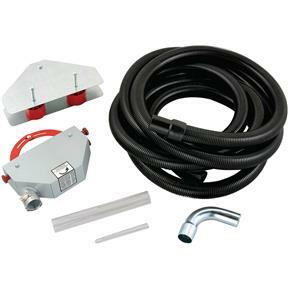 Kit consists of blade guard, dust tube, vinyl hose and roller assembly. Vacuum not included.Please note: due to the high incident of fraudulent transactions with orders containing name brand products, orders for this item must ship to the billing address. This self-contained Dust Collection Kit collects dust and debris when using Milwaukee's 6480-20 (H7000) Panel Saw. Kit consists of blade guard, dust tube, vinyl hose and roller assembly. Vacuum not included.